Come 2012, commuting on I-270 between I-44 and Manchester Rd will become a little easier and faster. MoDOT is planning on adding an additional lane in each direction to portions of the route, reducing travel times by up to two minutes. The 4 mile stretch of Interstate 270 between Manchester Rd and I-44 is one of the most congested segments of highway in the St. Louis region. Everyday, 150,000 vehicles travel along this section of highway which during the AM and PM peaks has a level of service rating of F and average speeds of 32 mph. The additional lane capacity should improve the LOS to D and increase average speeds to 60 mph. One option would add 1 lane in each direction from north of I-44 to south of Dougherty Ferry Rd. // MoDOT. In order to squeeze an additional lane on both sides of the highway, MoDOT will narrow the lanes on I-270 to 11-ft and reduce the width of the inside and outside shoulders. The tightest points will be underneath the Union Pacific and BNSF railroad bridges where the existing bridge support columns will reduce the shoulder to as little as 1-ft wide. The changes will be very similar to the ones used on I-44 and I-70 during the recent shutdown of I-64. In order to accommodate the increased travel demand on I-70 and I-44, MoDOT narrowed the existing lanes and shoulders in order to squeeze an additional lane in each direction. MoDOT is using its recent experiments with lane narrowing on I-70 and I-44 to justify its project on I-270. In particular, MoDOT says that the narrow lanes and shoulders on I-44 had no net impact on highway safety. Two options for lane additions on I-270 are still under consideration. The first option would add lanes from north of I-44 to south of Dougherty Ferry Rd. The second option would extend the northbound lane in option 1 to Manchester Rd resulting in six northbound lanes on I-270 between Dougherty Ferry Rd and Manchester Rd. The project is expected to cost a bargain-basement $3.8 – $5 million. Other related works push the project total up to $11 million as currently allocated in the latest Transportation Improvement Program. MoDOT and East-West Gateway previously applied for federal assistance through the TIGER grant program, but the bid failed. MoDOT estimates that a similar project on I-270 using standard width lanes and shoulders would cost in excess of $150 million. Exhibits showing some of the project impacts can be seen by clicking here. 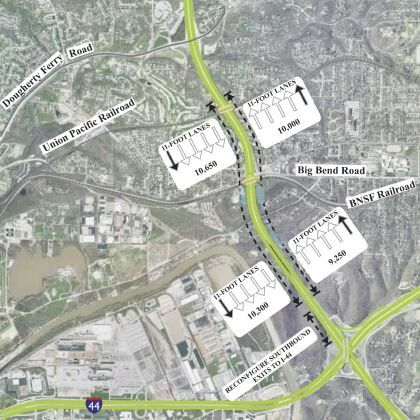 I would suspect the FHWA would conditionally approve the project in the same way it has conditionally approved of the narrow lanes on I-64 across the Daniel Boone Bridge. Due to the "sub-standard" lane-width, will FHWA conditionally approve this as only an interim improvement? But what are the conditions? Limited timeframe (an interim improvement)? Limited application (only within short-distance pinchpoints)? Other?